Why Pickled zucchini, mushroom and carrot salad? Salads during summer are ideal – fresh lettuces, ripe summer tomatoes and sweet balsamic. 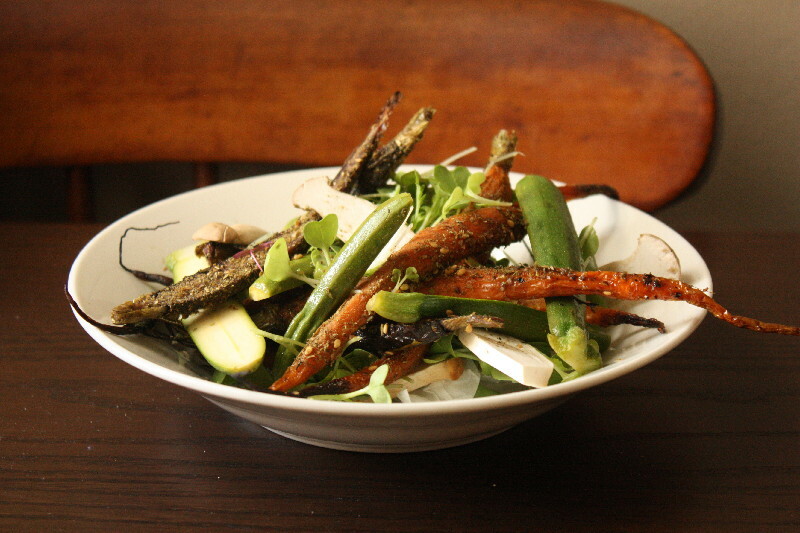 During winter however, salads need to be revamped. Although you will find tomatoes all year round – the flavour of one during summer will never compare. This salad of fresh pickled zucchinis with roasted dutch carrots and raw mushrooms has the crunch you want in a salad along with great flavours. Slice the baby zucchini in half length ways, if using regular zucchini slice into half moons. Place in a bowl and sprinkle over 1 tbs of flaked sea salt (¼ tsp regular salt). Gently toss. In a separate bowl whisk together the garlic, mint and vinegar*. Pour over the zucchini and leave to pickle while you prepare the carrots. Slice the carrots in half length ways. Toss with 2 tbs of olive oil and season with salt and pepper. Spread out in a single layer on a lined tray. Bake for 15 minutes until they are golden but still with a little bite. Sprinkle with dukkha and set aside. Remove the zucchini from the pickling juices and place in a large bowl. Gently toss together with the carrots, mushrooms, remaining olive oil and 2 tbs zucchini pickling vinegar. *You can store pickled zucchinis in an airtight container in their juices for up to 1 week in the refrigerator. I'm a little food obsessed; I wont lie. If you want the whole story read more here.